Virtual Serial Port Driver PRO is finally here! Eltima officially releases the highly anticipated – Virtual Serial Port Driver PRO! We are pleased to introduce our new versatile solution – Virtual Serial Port Driver PRO! 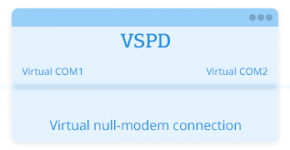 One of our core products, Virtual Serial Port Driver, is going strong! Our team is constantly working on improving the solution to keep our customers happy and satisfied. Virtual Serial Port Driver PRO is the advanced VSPD version which demonstrates our commitment to providing the best port virtualization software today. The program delivers an unrivaled combination of serial port virtualization and splitting functionality. Building on the strong feature set of Virtual Serial Port Driver and Serial Splitter, Virtual Serial Port Driver PRO gives customers an efficient way to manage multiple real and virtual COM port bundles. Redirecting data from one physical port to another real or virtual serial port, and more. With a slew of advanced capabilities it offers, Virtual Serial Port Driver PRO is ideally suited for a great variety of usage scenarios. This all-in-one tool will definitely come in handy for developers and testers of serial port software and hardware as well as any customers dealing with COM port products. If you own a standart version of Virtual Serial Port Driver or Serial Port Splitter you can upgrade with 50% discount – request it here.